Managing playback and subscribing to podcasts with Alexa hasn’t always been the easiest thing to do by default. Luckily the AnyPod Alexa Skill makes it much simpler. Are you a fan of online podcasts? Did you know you can stream several of them just by asking Alexa to play the most recent episode? This works for the “more popular” shows anyway. However, being able to subscribe to new shows and a getting decent playback experience has always been more elusive. There are, of course, workarounds for connecting a Bluetooth device or choosing what to listen to manually via TuneIn or Spotify from your PC. 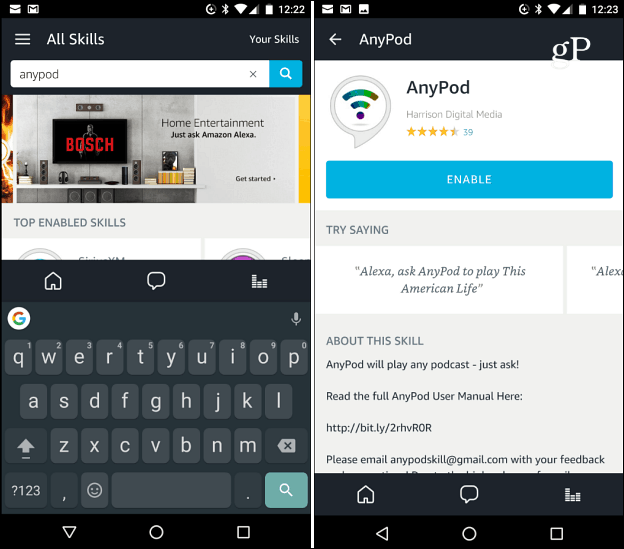 The cool thing is, a new third-party Skill has popped up called AnyPod that provides access to over 3,000 shows and provides much more functionality to podcast playback on Alexa enabled devices. To enable the Alex Skill AnyPod, open the Alexa app on your mobile device or head to alexa.amazon.com. Then open the Skills section and search by typing: anypod in the search field and click Enable. Personally, I listen to “lesser known” podcasts and even with over 3,000 in its library, the service couldn’t find them all. However, if you want a feature or podcast added, just email the developers. Also, you can download the full AnyPod User Manual here (which I recommend since there is a lot you can do).